This month marked the 100th birthday day of Albert Hoffman the discoverer of LSD. LSD inventor keeps on truckin' at 100 The drug was popularized by Timothy Leary, the one-time Harvard lecturer known as the “high priest of LSD,” whose “turn on, tune in, drop out” advice to students in the 1960s glamorized the hallucinogen. The film star Cary Grant and numerous rock musicians extolled its virtues in achieving true self-discovery and enlightenment. But away from the psychedelic trips and flower children, stories emerged of people going on murder sprees or jumping out of windows while hallucinating. Heavy users suffered permanent psychological damage. The United States banned LSD in 1966 and other countries followed suit. Mr. Hofmann maintains that was unfair, arguing the drug was not addictive. He has repeatedly said the ban should be lifted so LSD can be used in medical research, and he took the drug himself, purportedly on an occasional basis and out of scientific interest, for several decades. LSD was studied extensively by Dr. Oswald from Weyburn, Saskatchewan. Boing Boing: Midcentury LSD Experiments at Canadian mental hospital Yep little old Saskatchwan. Dr. Oswald had done earlier experimentations with mescaline which he had administered to the author Aldous Huxely. Oswald was a pioneer in LSD investigations, he was the originator of the term 'psychedelic'. The experiments conducted in Saskatchewan were the more positive aspect of LSD experimentation during the late fifties and early sixties. In the popular mind, d-lysergic acid diethylamide (LSD) research in psychiatry has long been associated with the CIA-funded experiments conducted by Ewen Cameron at the Allen Memorial Institute in Montreal, Quebec. Despite this reputation, a host of medical researchers in the post–World War II era explored LSD for its potential therapeutic value. Some of the most widespread trials in the Western world occurred in Saskatchewan, under the direction of psychiatrists Humphry Osmond (in Weyburn) and Abram Hoffer (in Saskatoon). These medical researchers were first drawn to LSD because of its ability to produce a “model psychosis.” Their experiments with the drug that Osmond was to famously describe as a “psychedelic” led them to hypothesize and promote the biochemical nature of schizophrenia. This brief paper examines the early trials in Saskatchewan, drawing on hospital records, interviews with former research subjects, and the private papers of Hoffer and Osmond. It demonstrates that, far from being fringe medical research, these LSD trials represented a fruitful, and indeed encouraging, branch of psychiatric research occurring alongside more famous and successful trials of the first generation of psychopharmacological agents, such as chlropromazine and imipramine. During the 1950's and 1960's the Canadian Defense Department, and the American Defense department and the CIA funded LSD research on unsuspecting Canadian subjects. They also did joint secret studies of Biological Chemical warfare weapons on the citizens of Winnipeg, and as we are finding out now, Agent Orange tests on unsuspecting Canadian troops and citizens in Gagetown NB. The most infamous of the CIA LSD mindcontrol experiments was the work of Dr. Ewan Cameron, but he was not alone. McGill university was also implicated in the illegal and unethical treatment of prisoners and unsuspecting patients by psychiatrists using LSD as well as other behavioral modification drugs and techniques. The experiments were even exported to Canada when the CIA recruited Albany, New York doctor Ewan Cameron, author of the psychic driving concept which the CIA found particularly interesting. In it he described his theory on correcting madness, which consisted of erasing existing memories and rebuilding the psyche completely. He commuted to Montreal every week to work at the Allan Memorial Institute and was paid $69,000 from 1957 to 1964 to carry out MKULTRA experiments there. The CIA appears to have given him the potentially deadly experiments to carry out since they would be used on non-U.S. citizens. In addition to LSD, Cameron also experimented with various paralytic drugs as well as electroshock "therapy" at 30 to 40 times the normal power. His "driving" experiments consisted of putting subjects into drug-induced coma for months on end (up to three in one case) while playing tape loops of noise or simple repetitive statements. His experiments were typically carried out on patients who had entered the institute for minor problems such as anxiety disorders and postpartum depression, many of whom suffered permanently from his actions. It was during this era that Cameron became known worldwide as the first chairman of the World Psychiatric Association as well as president of the American and Canadian psychiatric associations. Cameron had also been a member of the Nuremberg medical tribunal only a decade earlier. Canada was the one country that was extensively doing scientific and psychiatric studies on LSD, and would later influence the American studies such as those Ken Kesey went through and documented in his novel One Flew Over the Cuckoo's Nest. The CIA aghast at the result of its 'experiment' getting out of control later would plant phony LSD fear stories in the press of the day, Time Magazine in partiuclar, about how LSD caused people to stare at the sun and go blind or leap off buildings because they thought they could fly. The incidents may have occured, not during hippie Timothy Leary style 'trips', but when unsuspecting CIA agents had been drugged without their knowing it. The CIA dropped LSD but continued to practice narcopolitics with guns and weapons for heroin exchanges begining with the Vietnam war and it still continues today. As well as later connections between the CIA and the Cocaine cartels in Latin America. The War on Drugs was really about the war on drugs NOT supplied by the CIA. Always has been. CIA Hawking Heroin in Baghdad? And while Dr. Hoffman blames LSD's wayward travels as the popular Tune In , Turn On, Drop Out drug of the Leary hippie era, its scientific banishment was orchestrated deliberately by the U.S. government after MKULTRA and other CIA experiments on mind control proved failures, and the popularity of the drug was getting out of their control. Scientific research using LSD had to be restricted if not outright banned to cover up the covert studies done by CIA funded psychiatrists or else the scientific community would find out that results of so called benign studies were something more sinister. The Guardian reports on one of the original British scientists who studied LSD prior to the famous Timothy Leary psychedlic revolution, who wants to return to studying its impact on mental illness. The revival of the idea of studying the impact of LSD is because the British Home Secretary has called for an extensive review of the drug legislation in Britain. Will Clarke go soft on LSD and Ecstasy? Charles Clarke has ordered a sweeping review of drug laws which could lead to the effective downgrading of Ecstasy and LSD. The Home Secretary, who caused fury by resisting demands to toughen the rules on cannabis, said the current system of classifying drugs could be torn up. He is considering a new system which would take into account the 'social' consequences of each drug, including links to muggings and burglaries. Drugs are currently split into Class A, B and C.
In 1972 Canada like Britain plans to do today, did a comprehensive Royal Commission into the use of drugs. The Ledain commission is noted for its work around cannibis and the controversial reccomendation at the time, one that remains controversial, for the decriminalization of cannibis and recreational drugs. The study also included research on LSD. Canada was the soul source of scientific experimentation on LSD and for access to LSD even after the U.S. banned it. Long before Timothy Leary and the Summer of Love, patients at Hollywood Hospital in New Westminster were being treated with LSD. To Rick Doblin, New Westminster's Hollywood Hospital was a far-off place of myth and legend. It was 1972, and being a college student in Florida, he was keen to expand his mind. So he wrote to the hospital to see whether he could undergo its most famous treatment; a 12-hour trip into his consciousness, under the influence of pure Sandoz LSD. "It was the only place left where you could have a guided LSD experience in a controlled setting," Doblin says. But the hospital told him it would cost $600, more than an 18-year-old could afford, and the trip never happened. Canada remained a source of LSD for drug studies conducted in the late 1970's all were done on animals none on humans after the US Administration banned the scientific use of LSD. Today a new age of mind explorers, working in the computer enhanced virtual reality of the wired culture have re-discovered the positive uses of LSD. LSD: The Geek's Wonder Drug? The earlier researchers like Dr. Timothy Leary and Richard Albert (Baba Ram Dass) who used LSD to open the doors of perception ( as Aldous Huxely refered to his experiences on a similar hallucinogen; mescaline) this generation of mind explorers has their work to build on and Dr. Leary's later interest in computers. What goes around comes around and goes around and comes around. Todd Brendan Fahey made the Digital Leap at the close of 1994. The synthesis of psychedelic drugs and the Internet has not been widely written of by the mainstream media, but Fahey and others believe the relationship to run deep. John Perry Barlow remarked to Fahey, in an as-yet unpublished interview: "I'll go so far as to say, if the government succeeds in its War On (some) Drugs--if everyone who used marjiuana and LSD were to really be put in jails--America would not have an operational computer left." This remark mirrors Timothy Leary's assertion, to Fahey in 1992, that "Steve Jobs and Steve Wozniak were barefoot, long-haired acid freaks" and that Bill Gates was known to use LSD while at Harvard. Ian at Tilting at Windmills says Monte Solberg is singing a different tune about the crisis in trade between Canada and the U.S.
What is driving the Canadian dollar is the increase in commodity prices, oil, minerals, etc.and the foreign take over of several large scale Canadian businesses. And of course another rate rise on the U.S. dollar, Canada will follow suit with Bank of Canada President David Dodge playing 'me too'. Something he has been rightly criticized for by Jim Stanford of the CAW. Indeed, commodity prices surged again yesterday, with zinc hitting a record, gold trading at a 25-year high and silver near a 22-year high. Oil reversed an earlier decline and natural gas prices jumped, with many analysts predicting energy prices this year will surpass the lofty levels of 2005. With oil and other commodities accounting for about 35 per cent of Canadian exports, this all bodes well for economic growth. Crude oil prices have risen 10.2 per cent so far this year, on top of last year's 44.9-per-cent advance. But there's another positive for the loonie, namely foreign takeovers of Canadian companies, which boosts short-term demand for the currency. Yesterday, Saudi Prince al-Waleed bin Talal's Kingdom Hotels International and investment firm Colony Capital LLC offered to buy Toronto-based Fairmont Hotels & Resorts Inc. for $3.3-billion (U.S.). Last week, U.S. billionaire Jerry Zucker sealed a deal to buy Hudson's Bay Co., Canada's oldest company, by adding $28-million (Canadian) to his $1.1-billion bid. Dofasco Inc. was also up for grabs. If Arcelor SA's bid is successful, the Luxembourg firm will spend $5.6-billion on Canada's largest steel maker. And Swiss bank UBS AG said it will pay $173-million to buy the rest of its Canadian operations it didn't already own. "An announcement of a merger or acquisition can definitely lend short-term support," said David Powell, currency analyst at Ideaglobal in New York, especially because it's less liquid than other global currencies. He stressed that traders were reluctant to place big bets ahead of today's announcement by the U.S. Federal Reserve, marking the last rate decision with chairman Alan Greenspan at the helm. "This may be the calm before the storm," he said. "That's going to be the defining event of the day, the week, if not the month, the quarter and the first half of the year." the Canadian dollar will increase, what it doesn't need is to be artificially helped by Dodge. Nor does Canada's manufacturing industry need corporate welfare from the Conservatives. What we need is tripartite investment in industry, and securing it for trade purposes in the global market, that is institutional investment funds/ federal and provincial governments/union pension funds investing with ownership buy in. U.S. Fed chairman Alan Greenspan is retiring today with another of his 'rate increases' here is a short overview of his legacy; a boom that busted Americans savings and put the U.S. in debt to international investors. And this is called 'success'. Here was Ayn Rand capitalism in action, still the Uknown Ideal. Greenspan took his first steps into politics in 1968 when Anderson asked him to join Nixon's presidential campaign. Greenspan helped coordinate domestic-policy research and analyze poll data, writing computer programs to project the electoral vote count. Greenspan had met Anderson years earlier when both formed part of the intellectual circle of novelist Ayn Rand, a Russian émigré whose writings celebrated laissez-faire capitalism. Three of the essays in Rand's 1967 book "Capitalism: The Unknown Ideal" were authored by Greenspan, then the 41-year-old president of an economic consulting firm in New York City. "Chronic deficit spending (is) the hallmark of the welfare state," the future Fed chairman wrote. "The welfare state is nothing more than a mechanism by which governments confiscate the wealth of the productive members of a society to support a wide variety of welfare schemes." Widely viewed as the most successful chairman in the Fed's 92-year history, Mr Greenspan presided over an era of low inflation rates, low unemployment and the longest economic expansion in US history – a decade of uninterrupted growth from March 1991 to March 2001. In Mr Greenspan's early days, Wall Street investors were concerned that Mr Greenspan, who had advised Republican presidents Richard Nixon, Gerald Ford and Ronald Reagan, would lack the iron-willed independence needed to fill the shoes of Paul Volcker. Mr Volcker conquered a decade-long bout of double-digit inflation by driving up interest rates to levels not seen since the Civil War. Showing his own inflation-fighting credentials, Mr Greenspan pushed through a half-point rate increase at his first Fed policy meeting. After just two months on the job, the stock market crashed. It was called Black Monday, October 19, 1987; many investors blamed Mr Greenspan's credit-tightening. * From 1989 to 1992, hundreds of savings and loans and banks went out of business. * A global currency crisis began in Asia in 1997 and spread to Russia. Some 40 per cent of the global economy was pushed into recession. The US economy seriously was threatened before the Fed stepped in with a series of rapid-fire rate reductions in 1998. * The stock market bubble burst in 2000, wiping out trillions of dollars in paper wealth. During Mr Greenspan's 18½ years in office, the US had two recessions. The first was in 1990-91, when oil prices spiked after Iraq invaded Kuwait. The second came in 2001. Both were mild downturns that lasted eight months each. But Greenspan's record isn't completely unblemished. That period of non-stop growth, from 1991 to 2000, could have been managed better, said Marc Lévesque, chief strategist at TD Securities.Specifically, Greenspan should have started raising borrowing costs more aggressively toward the end of that run in order to cool the U.S. economy and engineer a softer landing, Lévesque said. Instead, a recession hit in 2001, and relatively low interest rates helped inflate the dot-com stock bubble before it burst. "The more the rise, the harder the fall. It didn't have to be that way," Lévesque said. "I hope they don't make the same mistake twice," he added, citing concern the frothy U.S. housing market could collapse.In a famous speech in 1996, Greenspan had warned of "irrational exuberance" in financial markets, but nobody listened.Greenspan's policy strategies also had a direct influence on Canada, both in terms of the health of the American economy and our own interest-rate environment and currency.Surging commodity prices, and most recently oil and gas prices, are behind much of the Canadian dollar's meteoric rise since the start of 2003.Greenspan can also take some credit or, as Canadian exporters may argue, blame.He kept short-term U.S. interest rates at rock-bottom levels in the wake of the Sept. 11 terrorist attacks. In response, foreigners dumped U.S. government bonds and headed for higher-yield offerings, including Canadian bonds, thus fuelling demand for loonies.He slashed the funds rate from 3.5 per cent on Sept. 10, 2001, to 1.75 per cent by the end of 2001 and 1 per cent by 2003.Greenspan's biggest mistake was going overboard in reaction to 9/11, said Andrew Pyle, senior financial markets economist at the Bank of Nova Scotia. "It was easing of fear as opposed to easing on fact. "You can give Greenspan the benefit of the doubt immediately following the terrorist attack, but he just kept on going, Pyle said. "Maybe consumers were overdue for a break after 10 years of non-stop growth in spending," he said. "He artificially kept them alive through low interest rates, and that probably exacerbated the (consumer) debt situation we have now." Accounts of the U.S. economic "miracle" of the 1990s typically omit one embarrassing detail: its dependence on massive amounts of foreign money. Here's a graph making that point: the net foreign debt of the U.S. (net meaning the difference between U.S. claims on foreigners and foreign claims on the U.S.). From the end of the First World War until the early 1980s, the U.S. was a net creditor to the rest of the world. Creditorhood is often thought to be the financial manifestation of imperial power; Britain was the world's major creditor country during its 19th century heyday, and the shift in financial power in the 20th century from Britain to the U.S. correlated well with what happened in the geopolitical sphere. With the explosion of the U.S. budget and trade deficits in the early 1980s, this all changed, as the U.S. government, corporations, and financial institutions borrowed heavily abroad. In 1982 - the year that Wall Street's great bull market began - the U.S. international debt account dipped solidly into the red, with net debts equivalent to 1.1% of GDP. (Debt doesn't figure in the calculation of GDP - it's just a way of making comparisons over time.) Since then, the U.S. debt position has gone deeper into the red every year except 1991 and 1993, reaching -22.6% in the second quarter of 1999, or just over $2 trillion. The slippage has continued even though what was once blamed as the culprit, the federal budget deficit, has turned into a supposedly virtuous surplus. There's no doubt that this inflow of borrowed funds - $1.3 trillion worth since Bill Clinton took office - has greatly stimulated both the real economy and the financial boom, by allowing people to borrow to consume (this is the most consumption-intensive expansion in post-World War II history) and by allowing people and corporations to borrow to buy stock. A more distant concern, but one that cannot be readily dismissed, is the very condition that has enabled the surge in American household and business demands to help sustain global stability: our rising trade and current account deficits. There is a limit to how long and how far deficits can be sustained, since current account deficits add to net foreign claims on the United States. It is very difficult to judge at what point debt service costs become unduly burdensome and can no longer be sustained. There is no evidence at this point that markets are disinclined to readily finance our foreign net imbalance. But the arithmetic of foreign debt accumulation and compounding interest costs does indicate somewhere in the future that, unless reversed, our growing international imbalances are apt to create significant problems for our economy. The risk is that at some point, the capital inflow will reverse, and leave the U.S. without a source of borrowed funds to power fresh consumption and stock-buying and with lots of bills to pay. That's not unlike what happened to Mexico in 1994 or Thailand in 1997. But those are weak countries, not an imperial colossus. What happens to a colossus when it gets cut off is very hard to predict. Maybe it will luck out; Asia and Europe could recover, and the U.S. could export its way out of debt by selling them 747s, Windows 2000, and Shania Twain CDs. Or maybe the U.S. in the early 2000s could be like Japan in the 1990s - stuck with a massive hangover from a burst bubble. Hard to say. Which isn't to deny that the bubble's most important promoter, more important even than Jack Grubman, was a real movement conservative - Alan Greenspan, Ayn Rand's most famous disciple. It's gratifying to see Greenspan's stock sinking. Several analysts have written up his embarrassing speech at the Federal Reserve Bank of Kansas City's annual elite retreat at Jackson Hole. But since this publication has been making fun of Greenspan for 15 years, long before it was fashionable, some piling on is in order. Greenspan argued that no one could really have known a bubble was underway - and even if he could, there was nothing he could have done about it anyway. Keeping to his line during the mania, he maintained that a bubble can only be recognized after its bursting, which might be a nice Hegelian point, but isn't a helpful guide to policy. Lots of observers less esteemed than Greenspan noticed one at the time, and presumably it's his job to stay on top of these things. He could have raised interest rates earlier, which would have burst the bubble, though it might have thrown the economy into recession as well; he can't be faulted for worrying about that. But he could have raised margin requirements on stocks - forcing investors who buy shares with borrowed money to put up more cash. This would reduce demand for stocks, but also send a hostile signal to the markets. At Jackson Hole, he argued that raising margin requirements would have had no effect on stock prices. That's not what he said at a policy meeting in September 1996. After listening to then Fed governor, now top Bush economic advisor, Lawrence Lindsey offer a comprehensive case that a bubble was well underway, Greenspan commented: "I recognize that there is a stock market bubble problem at this point and I agree with Governor Lindsey that this is a problem we should keep an eye on....We do have the possibility of raising major concerns by increasing margin requirements. I guarantee that if you want to get rid of the bubble, whatever it is, that will do it. My concern is that I am not sure what else it will do." Presumably his worry was about effects on the real economy, a reasonable concern, but he knew there was a bubble and that he could have pricked it. He did speak the phrase "irrational exuberance" a few months later, but when that was greeted with bad reviews, he turned into the New Economy's leading promoter and the guarantor of stock prices. Blogging Tory Dust My Broom is all in a tizzy over George Stephensons op ed piece in the Winnipeg Free Press about the influence of the conservative blogs on the federal election. Now Mr. Stephenson is a rep for the Manitoba Teachers Society, the teachers union and editor of their newsmagazine where he has a regular column. And he is by no means a radical or a left winger. He is liberal and a social democrat, indeed a trade unionist, none of which I would define as being a radical leftist. Cause I are one. So are these guys. Heck so are these folks and these folks and even these guys. Now what I find hilarious when I read these guys like Dust My Broom is their slavish devotion to the American right. For them Liberals are ranting left wingers. They caricature Canadian politics of the left and right as their Yankee mentors do. What they forget is this is Canada and our social and cultural political milieus is left wing. Compared to the U.S., and they know this cause they rant on and on about it usually quoting some rightwhingnutbar from south of the border, we are bloody damn well socialists up here. Which doesn't mean we really are. We are a liberal social democratic culture. But of course that's so far to the left of the U.S. we make Democrats look right wing. During the Free Trade Debate back in the eighties the Economist called Brian Mulroney and the Progressive Conservative government Bleeding Heart Tories. The editorialized that though Mulroney was friends with Reagan and Thatcher his PC party was to the left of the Democrats! The Radical Left Dust My Broom whines about is to the Left of the NDP. For instance the Radical Left in Canada is well represented in the pages of Canadian Dimension magazine published in Winnipeg, which is Dust My Brooms stomping grounds. So these Blogging Tories have no excuse for not knowing what Radical Left Wing really is. But like all the majority of their ilk that populates the Blogging Tories aggregator they view classical liberalism as a threat to their Americanized ideology of the right. Which is rather funny when you consider that the historic right wing is actually liberal. The Whigs who were the Liberals of their day in England stood for what today are considered classic conservative values of individualism, private property and Laissez faire. The fact remains that in the federal election last week, Canadians elected a majority of liberal, social democratic MPS from three parties. None of them socialist or particularly left wing. But by Blogging Tories and the Fox Network standards all would be considered raving Marxist Leninist. The BT broadly paint Canada's centrist social democratic politics as Left. As if it was a prejorative. True it is Left in the classic ideal of social democracy of the turn of the 20th Century. And it is the majority political and social ideology in this country. Which just drives these wannabe American nuts. The reality has still not dawned on them that they live in a social democratic country, that while we are to the left of the U.S. Canada politically is actually closer to the classical liberalism of Bentham, Mills, and Godwin. Even our social conservative right wing Conservative party under Stephen Harper had to move to the classical liberal centre, darn even towards the social democratic consensus that makes up Canadian Real Politicks. So when these right wing Canadian wannabe American Right Whingers whine about the left remember it's not the Canadian Left they are talking about. It's anything to the left of Attila the Hun they are ranting about. No not Quebec and Canada or Alberta and Canada. This is the economic solitudes, where the corporate elite get the baked Alaska while the average Canadian has to work more than one jobs because of low pay. Where unionized workers fight hard for a piddly 2.5% wage increase and still face hostile management that wants concessions, while Bank Executives get wage and benefit increases of 24%. The growth of low-paying and part-time work is taking the shine off a 30-year low in Canada's unemployment rate, according to a CIBC World Markets report. Top executives of Royal Bank of Canada and Bank of Montreal saw their 2005 pay packages move in different directions last year, reflecting the state of affairs at their two operations. And don't forget Big Oil and their record profits. Makes Alberta' Prosperty Bonus look like peanuts. Heck it makes Alberta's royalities and taxes off oil and gas look like peanuts. It's hard to celebrate a profit of nearly $11 billion when almost no one wants you to enjoy it. The crying and gnashing of teeth you here is the sound of Canadian nationalists bemoaning the sale of Canadian cultural and economic heritage icons. The Hudsons Bay Co., whose HBC blanket colours are the official colours of Canada's Winter Olympic team,. And Fairmont Hotels the privatized former CN Hotel Chain which includes the great rail hotels like the Banff Springs, Lake Louise and The MacDonald hotel in Edmonton. Yep they have been sold off to the highest bidder, in the case of HBC to an American vulture venture capitalist, and in the case of the Fairmont Hotel Chain to a Saudi Prince. Now before folks started dribbling tears of national grief over their beer, don't forget that Labatts is owned by the Belgium Interbrew and while Molsons remains Canadian owned its shareholders includes the Coors family. And while the picturesque Mountie in the Mountains picture is one of our familiar icons today the Disney chain owns the rights to all promotional materials for the RCMP. Welcome to neo-liberal globalization. Whatever can be sold off will be sold off. Heritage, whats that? Remember all those little flags Shelia Copps gave out were made in China. Next time the Fraser Institute or the Conservative hacks talk about neo-liberalism, free trade, and pirvatization is good for Canadian business remember business is global. Not national. What ever isn't nailed down will be sold! And of course Canadians and Canadian workers don't benefit its Canadian capitalists and corporate bosses do. And when it comes to capitalism, money knows no nation. What would Conservative MP Monte Solberg do without his coffee from Timmies (Tim Hortons)? We would never get a sound bite out of him. Now some of his pals over at the Blogging Tories have begun a campaign to get Timmies to open a store in Afghanistan to supply our troops with REAL coffee, none of that Americun stuff. Canadian Soldiers deployed in Kandahar, Afghanistan are looking for a familiar taste from home. What is more Canadian than a "double double" Tim Hortons coffee? Tim Hortons leaps in to the story! Stay caught up! Have your say! When it comes to coffee these guys who are normally America Rah Rah types suddenly turn into Canadian Nationalists. Must be Timmies Maple donuts. True Folgers and even Maxwell House are blah coffee, hence the success of Starbucks. And Timmies makes a great cup of Columbian joe. Though it's owned by the American fast food chain Wendy's. These pro war Blogging Tories are upset that Timmies isn't willing to go into the war zone to open a franchise. Guess they believed those Timmies ads about supplying that kid in Oxford with his Timmies care package. If its good enough for an Oxford scholar it must be good enought for our troops. 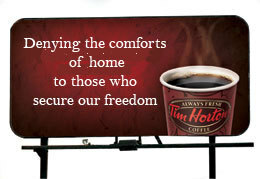 As for the politics of all this, I say that the troops don't really need a Timmies franchise in the war zone. By the end of February, Canada will have about 2,000 soldiers in Afghanistan, including a new group at the PRT. Some 700 soldiers will replace an American force, Task Force Bayonet, that has been fighting Taliban remnants in the more remote areas of Kandahar Province. We should withdraw our troops from Afhghanistan and have them drink their Timmies coffee in the safety of the bosom of Canada. So all those Conservative parents who think that there should be no state funded day care and damn them they know what is best for their kids, so just gimme my money and I will spend it . Conservatives got all upset about Scott Reid's election comment on them spending their government baby bonus checks on beer and popcorn. Cash registers were ringing this weekend as Albertans flocked to retailers to spend their $400 provincial resource rebate cheques. But not on beer and popcorn only cause the Brick has a sale with double Ralph Bucks. Yep buy a hide-a-bed on sale with your Ralph Bucks and they will match it. Perfect for when baba stays over to babysit. Put up or shut up Pardner. 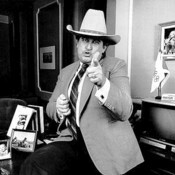 Well will it be a good old shoot out between the Feds and Ralph at the Saddledome? Two cowboys go at medicare, will it survive the Calgary treatment? Ottawa - Alberta can go ahead with all the health reforms it likes -o long as it stays within the rules of the Canada Health Act, says a spokesman for the incoming Conservative government. Blogspot down Today. But For How Long?